Klaus Boetig set foot in Greece for the first time on Christmas Day of 1972. He came on a train from Germany and spent the night at a cheap hostel in Plaka. 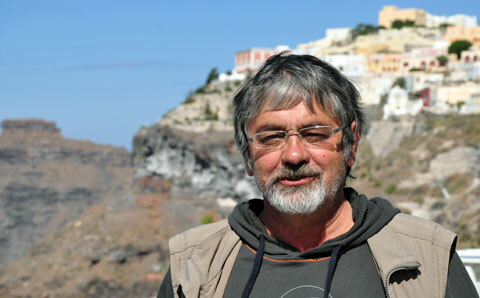 Since then, the 63-year-old Bremen-based author has visited Greece almost every year and written more than 70 travel guides on all parts of the country. Many of these have been translated into more than 10 different European languages and three have been published in Greek. His travel pieces have appeared in dozens of newspapers, magazines and information brochures, including a German publication prepared by the Greek National Tourism Organization (GNTO). Ironically, Boetig tries to avoid Greece these days. Two years ago, his name was embroiled in a controversy that still lingers. It all began when the German weekly news magazine Focus came out with the now-infamous cover depicting the iconic Venus de Milo statue draped in a Greek flag and showing her middle finger. “Cheats in the Euro family,” read the headline. The cheats, of course, were the Greeks. The publication, which was published on February 22, 2010, prompted a group of Greek lawyers to sue a dozen staff journalists at Focus as well as Boetig, a freelancer, for defamation and libel. Boetig, the prosecutor said at the time, consciously misguided readers about the character of the Greek people. She says the authors made and distributed false claims about the Greeks while knowing that those claims were false. Moreover, Fragaki adds, the cover and the articles carried comments and opinions that, directly or indirectly, vilify the Greek people, their history and their culture. “These articles in effect put in doubt the social and moral value of Greek society and disparage its integrity,” she says. The misunderstanding appears to also have a more literal dimension. “Those Athenian lawyers that took me to court do not speak and read any German at all, or not enough to understand a funny and ironic article,” Boetig says. Monika Freude, Boetig’s lawyer on the case, says the prosecution tried to ground its allegations on a translation of the piece prepared by one of the Greek lawyers involved in the case (lawyers in Greece have the right to make official translations). This lawyer, Freude says, basically copied an inaccurate and incomplete translation making the rounds on the Internet. Freude, an Athens-based lawyer from Germany, said the defense had to make sure a new official translation by the Foreign Ministry was made available to the court. A German speaker who is not connected to the case and who was consulted by this newspaper believes Boetig’s article is written in a thinly veiled ironic tone. Satirizing people’s egoism, tolerance for corruption and aversion to rules, the article brims with cliches and generalizations that seem to mostly describe provincial and mostly outdated attitudes and habits, like suggesting that streets have no names or that Greeks are too attached to their Orthodox saints. Boetig claims to have received different feedback. “Most German readers of the article loved it, because in all the words they felt my love for Greece,” he says, adding that several philhellenic groups outside the country had asked permission to reprint his story. “Also many German-speaking Greeks in Germany assured me that they felt neither embarrassed nor offended by my article,” Boetig says. He is less willing to defend the cover. “It was unfriendly, but no matter for the courts,” says Boetig, who is not represented by the Focus legal team. However, upsetting as the cover or the article may be to some people, legal experts say their publication was not a punishable offense. The Greek law in this case must be read in the light of the European Convention on Human Rights (ECHR). Drafted in the framework of the Council of Europe, this multilateral international treaty enjoys primacy over national law. “If the Greek courts condemn the author of the article at issue, the victim will eventually bring a case against Greece before the European Court of Human Rights,” explains Vassilis Tzevelekos, a lecturer in public international law at the University of Hull. The Focus case is a special one as the alleged insult does not target a specific individual, or group of individuals, but rather the Greek people as a whole. However, the ECHR does not protect national pride as such. This makes this case different to, for example, the Mohammed cartoons controversy in Denmark, where religious freedom is pitted against freedom of expression. The prosecution could claim that the right of free expression was abused — something that the ECHR prohibits. “Freedom of the press goes as far as where one’s personality is offended; this is a fundamental rule of the journalistic code of ethics,” Fragaki insists. However, experts unrelated to the case say neither the cover (Boetig does not face charges about this) nor Boetig’s story was abusive. Tzevelekos says Focus should be allowed to send the message it wants to send, using the means it considers appropriate for that purpose. “Freedom of expression is a vital condition for pluralism and polyphony within a democracy. Everyone, and especially the press, shall be free to make value judgments regarding questions of public interest. Offensive or even shocking as they may be, they must be tolerated. This is the essence of democracy,” he says. Holding Germany responsible for much of the austerity measures imposed on the country in the last couple of years, Greek media and political satirists on TV and radio have often verged on politically incorrect territory. The sight of German Chancellor Angela Merkel in Nazi uniform is not an uncommon one. An Athens radio station was recently fined 25,000 euros by Greece’s radio and television watchdog after one of its journalists, Giorgos Trangas, verbally abused Merkel last year. In principle, Greek courts can lawfully restrict the freedom of expression. But for an intervention to be legal it must be prescribed by law, pursue a legitimate aim, and be “necessary.” This last clause suggests that the limitation will be proportionate, meaning that a fair balance is struck between the aim of the limitation and the means used by the state for that purpose — in this case the sanctioning of Focus. “I really find the picture [of the Venus de Milo] at issue to be in bad taste, not to say cheap,” Tzevelekos says. “However, the fact that I disagree with it or that I see it as ‘trash-press’ does not mean that the editors should be deprived of their freedom of expression,” he says, adding that he sees absolutely no reason why the Greek courts should interfere with the freedom of expression of the foreign press to protect national pride. If Greek courts are really interested in protecting national pride, Tzevelekos says, they will have to prove how much they value freedom of expression. “National pride is not protected in court,” he says. The statute of limitations has expired for offenses which carry a prison sentence of up to one year, as long as the crime was committed before 31.12.2011. This concerns the charges of defamation, which foresee penalties of up to one year. The charges for libel however foresee penalties of at least three months’ imprisonment and up to five years. The next hearing at the Athens Misdemeanors Court is on Friday. Meanwhile, back in Bremen, Boetig says the controversy has not really affected his life. “I got many friendly letters from all over Greece and Germany. Some friends in Greece wanted to ask the mayor of their village to name a ‘plateia’ (square) after me, some others wanted to collect money to pay for my lawyers,” he says. Because of burgeoning legal expenses and the slow pace of proceedings, Boetig is concerned the trial will leave a hole in his bank account.